Need to add custom code to a particular page on your site? Website Builder v7 makes it easy with a drag-and-drop HTML tool. If you need to add code that will be applied to your entire site, see Change site settings . You should not use this tool to embed YouTube video. For that, see Adding apps. While we are happy to explain how the HTML Code tool works, we cannot troubleshoot issues with any third-party code you might add to it. Warning: Do not use this tool unless you're experienced at hand coding with HTML. Do not copy and paste HTML code from third-party sources unless you trust that source and fully understand how the code works. To learn more about the dangers of malicious coding, see this Wikipedia entry on HTML script injection. Navigate to the page to which you want to add the code. Click the HTML Code tool in the left-hand toolbar. 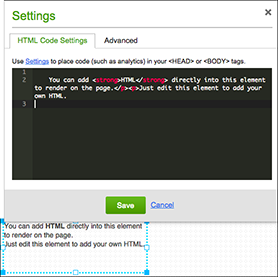 A new text box is added to the page, and the Settings window's HTML Code Settings panel opens. Replace all the code in the black panel by pasting in what you copied or by entering your own code. Click Publish to apply the changes to your website. When the confirmation window displays, click the live link to see your site changes. How to ember HTML code in gocentral?